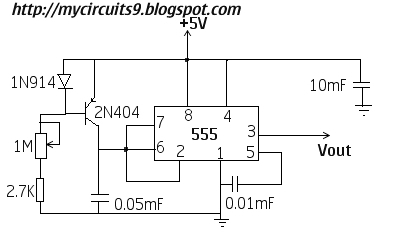 The 555 astable multivibrator can be used as a free running ramp generator. when the frequency determining network Ra and Rb in the 555 astable multivibrator is replaced by a Current mirror. 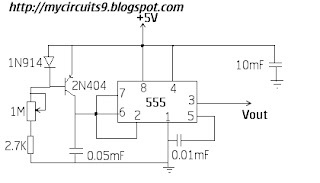 Figure shows the circuit diagram for free running ramp generator. The current mirror starts charging capacitor C toward Vcc at a constant rate. When voltage across capacitor C equals 2/3 Vcc (Vcc-5V), comparator 1 turns transistor Q1 on, and C rapidly discharges through Q1. However, When the discharge voltage across C is approximately equal to 1/3 Vcc, comparator 2 switches the transistor Q1 off, and then capacitor C starts charging up again. Thus the charge-discharge cycle keeps repeating. You can try our Led Emergency Lamp Project. We will update the site with more circuits related to LED, shortly.